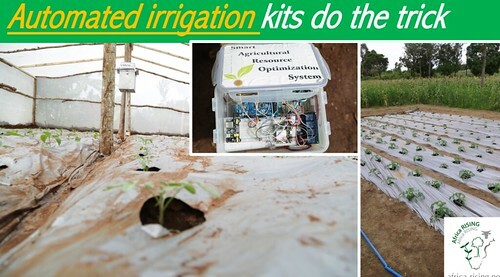 A solar powered automatic irrigation kit is showing promise in helping vegetable farmers in Tanzania, particularly women, use water resources more efficiently in farming. Currently being tested in Gallapo village of Babati District in northern Tanzania, the Smart Agricultural Research Optimization System (SAROS) irrigation kit saves labour and cuts water use in vegetable farming. It automatically monitors water use based on actual climate-smart data and knowledge, hence its moniker ‘smart irrigation kit’. By keeping tabs and using the real time data to ‘decide’ whether it is time for plants to get that much needed precipitation or not; the kit also reduces water wastage. Early indications from a review of the kit’s use are that it will help the smallholder farmers use the increasingly scarce water more efficiently. Mama Monica Pascali, one of the farmers piloting the kit notes that the fact that it is solar powered allows her and fellow farmers to use in the village without relying on electricity. She adds that it reduces her labour demands and drudgery because it adapts to the specific amount of crop water demand by using a real-time system for monitoring the farm environment. An in-built soil moisture sensor auto-triggers irrigation based on soil water deficits resulting in 40% less water use and 60% labour savings. Most smallholder farmers in the district do not have access to agronomic information including when to plant, when and how to apply nutrients and struggle with quick response to challenges they encounter in the field. Mobile phone usage in Africa is playing a vital role in the livelihoods of smallholder farmers. Being easy, fast and a convenient way to communicate, mobile phones allow for prompt answers to respective problems and for exchange of vital market information. A mobile-based platform to improve decision-making dubbed MWANGA is now available to help smallholders overcome the gaping information lacuna. The MWANGA platform runs from a dedicated Android app ‘Telerivet’ and has a current membership of 2,050 individuals within 13 communities in Babati District, and is now expanding to sites in Mbeya and Iringa. 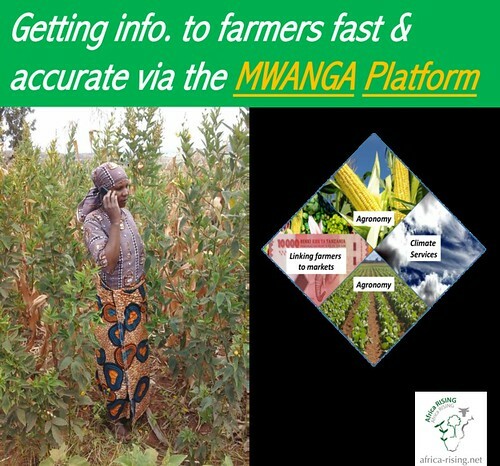 The platform also provides farmers with information on when project activities such as meetings, field days and training opportunities are scheduled to take place and serves as a pass through communication channel to agricultural extension agents who are on the ground to offer subsequent advice to farmers. ‘There are synergies where input/output markets could provide information that can be pushed to thousands of farmers in just one click from the MWANGA Platform. The platform is interactive and farmers can also send information to the platform for subsequent feedback,’ notes Fred Kizito, the MWANGA Platform innovator and International Center for Tropical Agriculture (CIAT) scientist. Fertilizer recommendations for smallholder farmers in Bahati are often based on regional soil assessments, with little relevance to critical local biophysical or socio-economic characteristics. Increasing crop yields and efficient use of inputs requires site-specific recommendations sensitive to local climate, soils, crops and yield potentials. Data on key soil properties are crucial for farmers’ decisions on managing soil and for agro-dealers to know what nutrients to sell. Soil testing is, however, rare outside of large commercial farms and experimental plots. Closest to Babati, soil analysis services are only available in Arusha and some advanced labs in Nairobi and the services are expensive. SoilDoc is a portable, on-site soil testing kit that allows for diagnosing of soil constraints in farms and provides opportunity for tailored fertilizer and organic input recommendations for farmers. In this way, extension agents can advise farmers on best management of their farm to increase production including what types of nutrients are needed and where to apply. 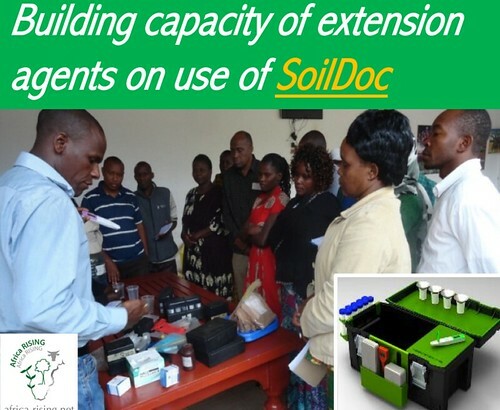 To boost capacity for soil testing, Africa RISING partners in 2017 trained 13 extension agents in Babati on essentials and operation of the SoilDoc kit. The awareness created has resulted into a demand for more kits, and scaling up the training to other agents. ‘Our traditional maize-bean-pigeon pea intercropping affects productivity even of maize. In this new practice which entails planting two rows of maize planted (about 45 cm) apart followed by a row of beans and a row of pigeon pea occupying the wide space before the next set of maize rows, I see already maize is doing good and beans too! I am satisfied with it under this season’s weather,’ notes Paulo Joakim, a smallholder farmer from Sabilo village in Babati District. 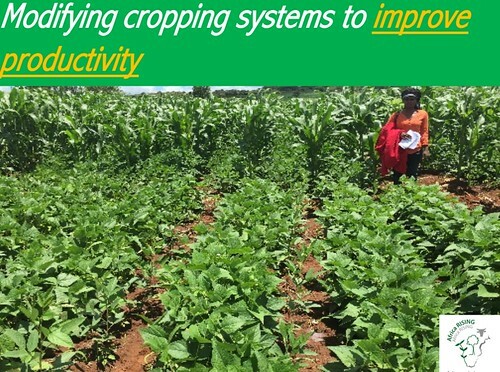 In the traditional intercropping system applied by most farmers in Babati, the productivity of beans and pigeon pea is always low partly due to competition from the maize being grown as part of the intercrop. A change in the plant configurations to allow more light and aeration of beans and pigeon pea within this system is important. In collaboration with the smallholder farmers, Africa RISING scientists have designed this localized version of the ‘mbili intercropping’ and the ‘doubled-up legume system’, to overcome these challenges and ensure farmers get the best yields. 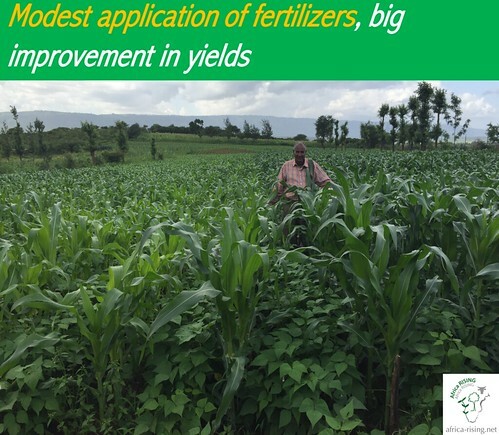 This tailor-made innovative cropping systems involves two rows of maize planted about 45 cm apart followed by a row of beans and a row of pigeon pea occupying the wide space before the next set of maize rows. So far, farmers say the new system has improved beans and pigeon pea yields relative to conventional maize-legume rotation system. Soil fertility is steadily declining in locations that were hitherto considered ‘fertile’ due to continued farming with sparse organic inputs thereby benefiting only fields closer to homesteads. Research by Africa RISING in the district has shown that such areas can reclaim their fading fertility through modest application of fertilizers. In parts of Babati where this work has been implemented, nitrogen application rates of 50 kg N ha-1 are adequate to achieve a good crop harvest across all agro-ecological zones. Phosphorus is also needed but in small quantities. 15 kg P ha-1 is good enough. In a good season, or in the medium altitude zones, a shilling invested in fertilizers bought at prevailing market prices returns 2 or 3 more shillings (partial economic analysis; see table below). Under the same environment, up to 4 more shillings can be obtained. Only under low moisture conditions (low altitude low rainfall agro-ecological zone for example) where Minjingu Mazao was not profitable. It is good news that we have now moved to Minjingu Nafaka plus! Table 1: Costs, benefits and marginal rates of return for different treatments in three ecozones of Babati District. Farmers in Babati District struggle to produce enough food for their families. Part of the reason is that water and wind erode the top soil – the most productive part of the soil which helps farmers boost their yields. 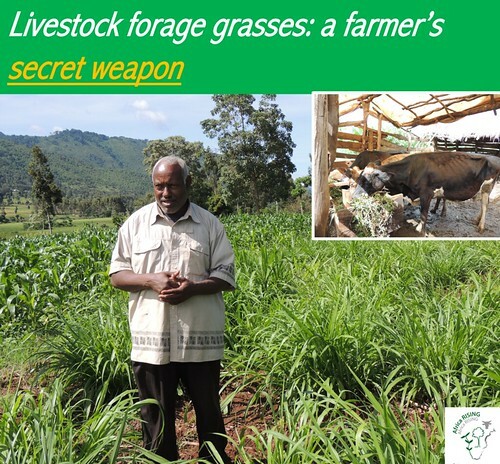 Through Africa RISING, smallholder farmers have been introduced to systematic planting of forage grass–forage legumes which ensure farmers get other benefits in addition to having a source of nutritious feed for their livestock. Action research implemented in the farming communities has shown impressive benefits accruing to farmers when they plant these forage grass-forage legume combinations, particularly for erosion control and soil moisture retention. The studies demonstrate that the combinations significantly lower water run-off by 4- 60% when implemented in intercrops with maize and pigeon pea for example. Plots with the same intercrops also records higher soil moisture storage with an average of about 25 mm of moisture over a depth of 50 cm — 30% higher (supporting ecosystem services) — in areas with forage-legumes than in areas without forages as well as erosion control in the landscape (regulating services). A significant contribution of this intercrop arrangement has also been shown to significantly contributing to recharge of the aquifers and subsurface flow. Not only do forage legumes such as lablab and cowpea provide ground cover and reduce soil water evaporation, but they are also dual-purpose crops that provide a secondary source of food that helps farmers meet household nutritional needs. Cover crops and fodder legumes are known for high nitrogen fixation. The yields from forages can also be sold through the fodder value chain and they play a critical role in risk reduction as income buffers. In addition, through the well-known ‘push-pull’ practice, forages serve as a pest and disease control mechanism. The forages further help reinforce contours which require less labour to maintain during the cropping season. Majority of smallholder farmers in Babati are engaged only in farming and have no influence over the management or participation in farm product value chains. Such farmers are not well connected to markets, so their production is not well tailored to what the markets need. Africa RISING partners have been implementing specific activities to link these farmers to profitable markets. 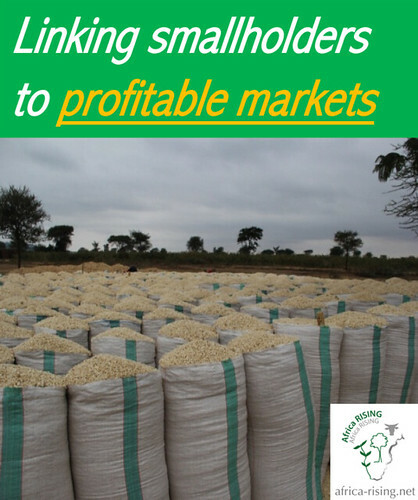 A first step to their integration in the value chain was to support them to improve their farming skills through use of improved seeds and fertilizers in the cereal-legumes value chain so that they could produce higher yields of more consistent quality and that was better suited to the market. Taking a marketing approach, the team brought the farmers together to strengthen their competitive advantage at the point of sale by improving quality, quantity and time of delivery through collective action. This also enabled them to access marketing information readily. Eighteen farmer groups have been established/strengthened in 10 villages and farmers have been trained on the use of improved seeds and fertilizers to increase production, value chain concepts, marketing and agri-business skills and how to use ‘e-soko’ to access market information. They have also been linked to big maize/pigeon pea/common beans traders in the district such as the Export Trading Group, Bajwa Farmers and Traders, Monaban, and Mohamed Enterprises Ltd, who can buy their produce at harvesting, or through contracts arrangements. A critical element of Africa RISING strategy for sustainable intensification is to actively engage in developing, validating and deploying new and improved germplasm to smallholder farmer communities. Scientists and agronomists involved in the program have over the years been working to provide higher yielding, more nutritious, and drought and climate resilient crop varieties to farmers. Importantly too, these new varieties are adapted to the local context and farmers’ localized production conditions. 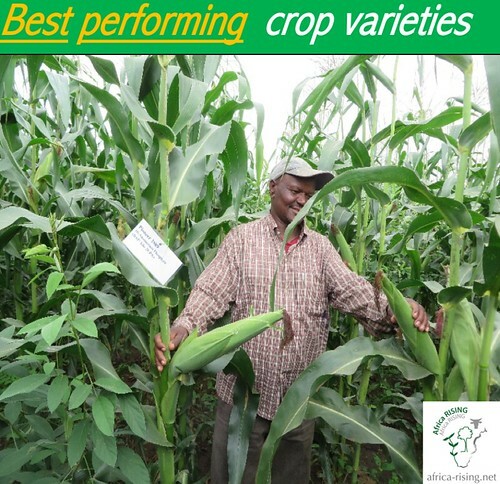 In Babati, new maize varieties Meru H513 and Meru H515 have been tested locally by farmers both in low and medium elevation and have shown impressive results over the past cropping seasons. The improved pigeon pea variety, Mali, which was also validated by farmers has shown excellent performance in terms of yield and is replacing the local varieties grown as intercrops by farmers. Farmers are looking for improved crop varieties that will enhance their productivity, and these new varieties and others still being validated by Africa RISING in Babati will go a long way in helping them improve their livelihoods. Tags: africa rising, AfricaRISING, Babati, technology adoption. Bookmark the permalink.